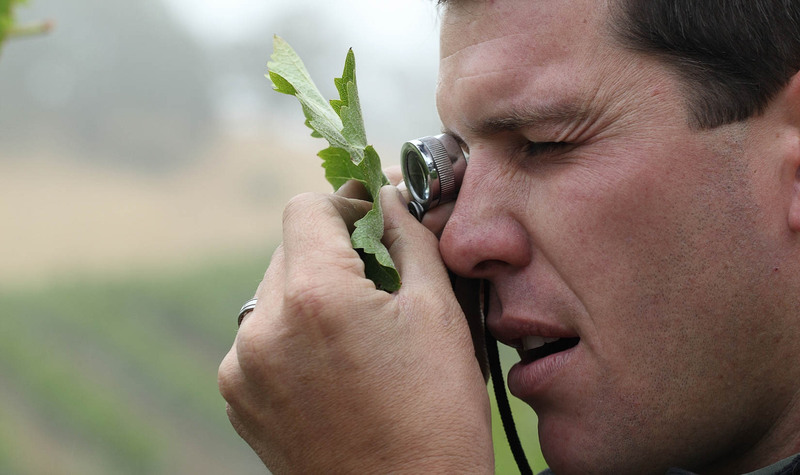 Brent Young’s work as a harvest intern in 2005 led the winery to create a new viticultural position focused on elevating our farming techniques. Promoted to Ranch Manager in 2012, he handles vineyard management, precision viticulture, sustainable farming and other ranch preservation programs. A fifth-generation resident of Sebastopol, Calif., Young comes from a long line of Sonoma County farmers specializing in dairy and agriculture—experience he utilizes tending to Jordan’s expanding cattle herd. He was born in 1980 and attended Sebastopol schools before leaving for California Polytechnic State University in San Luis Obispo, Calif., where he received a Bachelor of Science degree in Wine & Viticulture with a Viticulture Concentration in 2005. After completing his internship at Jordan, he worked for Kunde Family Estate from 2006 to 2008 before returning to Jordan as viticulturist. Young led an extensive soil-mapping study of every Jordan Estate vineyard block, which was completed in 2009. “It’s so great to work with a winemaker that has such history with the land and such passion for his work,” Young says. “The only tool Rob didn’t have available was a window to the soil, and I wanted to provide it using the latest advancements in soil research.” Rows are now microfarmed according to soil type, texture and water-holding capacity, which in many cases means Young now changes irrigation, cover crops, thinning and other farming practices within a single row and many times within a single acre. He also uses Global Positioning System technology to further divide the Jordan vineyard blocks, which allows him and the vineyard crew to effectively target each vine’s needs. Precision farming is closely linked to the sustainability philosophy Young follows. He rebuilt our hillside irrigation systems beginning in 2009 to decrease water and electricity use while strategically targeting specific vines with water only when necessary. From diversity of cover crops and beneficial insects to composting and recycling, sustainable practices span all aspects of Young’s viticulture responsibilities. Young also manages several green business certifications. An avid technology buff, Young is constantly experimenting with the latest tools. He implemented an electronic soil moisture program to measure soil moisture content and vine stress remotely from iPhones and computers. Working with AgCode Inc., he developed a custom iPad app that allows him to handle most vineyard management tasks on a wireless tablet—in real time, in the vineyard. With the expansion of our diversified farming philosophy, Young was promoted in 2012 to another newly created position managing the entire property. Named the 2011 “Outstanding Young Person in Agri-Business” by the Sonoma County Harvest Fair, Young is a board member of the Sonoma County Winegrape Commission and the Santa Rosa Junior College Viticulture Advisory Committee. Other memberships include the American Society of Enology and Viticulture and California Certified Organic Farmers. He and his wife spend their free time showing cutting horses. He also shares his father’s love of restoring vintage cars, especially Woodies.